Mobile technology has expanded dramatically around the world. Now, mHealth—the provision of health services enabled by mobile communications—is poised to revolutionise the way healthcare is delivered. The features of smart phones like sensors, location detectors, wireless connectivity and cameras etc. make it ideal to use for health applications. Mobile devices allows you to contact medical services from any part of the world and connected local medics will be instantly aware at the time of major problem like heart attack. The growth in essential networking between patient and doctor or among physicians is noticeable through smart mobile devices. Connected mobile medical devices are made by assembling a range of sensors and robust mobile processors, which are capable to transfer loads of information to share with medical professionals. Medical practitioners and technologists are researching methods to be used as new promising mobile solutions to keep you healthy. Soon you will be able to share your exercise levels, heart rate, activity, and other essential data gathered by your mobile phones with your doctor. 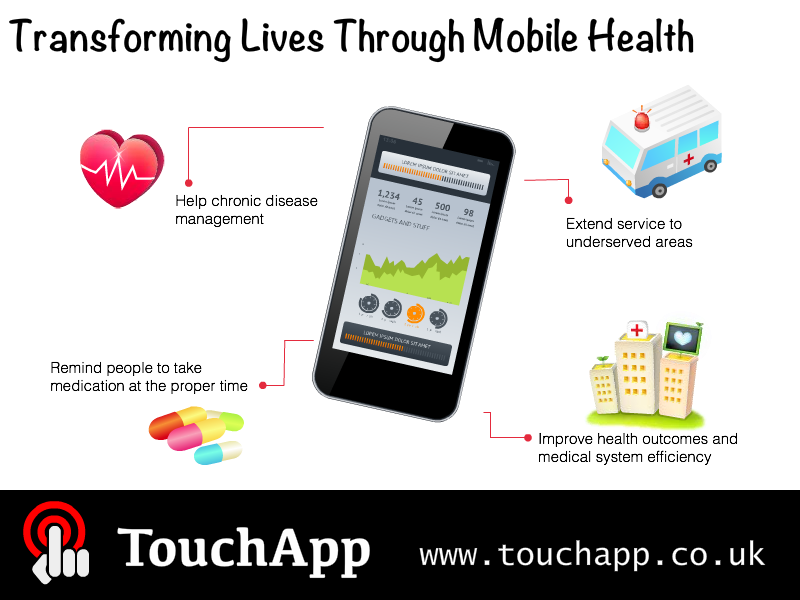 For menial problems you won’t need to go to hospitals as you can get monitored from smart phone connected monitoring devices at your home and get advice from the physicians. According to research and markets visionary, mHealth applications will become an interspersed part of doctor’s treatment plans soon as these are already in practice. There has been an explosion of mHealth initiatives around the world. Verification of an iPad app, which enables aphasia sufferers to connect with doctors, is in progress by UK Stroke Association. Sierra Wireless in Canada is experimenting to build a smart watch, which can regulate daily routine and function administration for individuals with cognitive disorders. Swiss scientists are developing a tiny implant, which can measure your body physiochemical activities and the observations such as blood protein and glucose levels are conveyed to doctors with Bluetooth of your phone. Even though mobile technology fulfils health opportunities and needs, there are some significant obstacles like limited guidelines, data security and network access. Regulation, education and proper awareness should be ensured for the best possible results. The knowledge gap between mobile technology and health professionals should be bridged. Mobile health developers and manufacturers, in collaboration with healthcare providers and government should work closely together to deliver an effective, accessible mHealth system.